Capsule Summary: Hawkeye refuses to rest and insists on continuing to perform surgery. He grows increasingly unstable, worrying Trapper, Henry, Radar, and even Frank and Margaret. If I have one complaint about this episode, it’s that Hawkeye never looks exhausted to the point of becoming unstable. I think Alan Alda convincingly portrays him as increasingly loopy but he doesn’t look the part. His eyes are a little red at times but otherwise he appears his normal self: slightly disheveled with perpetual stubble. There are no bags under his eyes, however, which is a hallmark of lack of sleep. Also, there could have been more discussion about Hawkeye operating while suffering from sleep deprivation. Trapper and Henry try to convince him not to operate but he does anyone. Frank and Margaret then complain that he’s operating below par. That’s when Henry orders him to avoid surgery for the next 48 hours. Hawkeye does anyone and afterward Henry confronts him. Maybe Henry realized that a tired Hawkeye was still a good surgeon and a needed one. Although there was no mention of an unusual deluge of patients, there was a constant flow of wounded. Nobody suggested getting a temporary replacement surgeon to allow Hawkeye to get some rest. Henry actually says someone else could have operated instead of Hawkeye, so there weren’t too many patients. Having Hawkeye make a mistake in surgery while tired would have been too dark for M*A*S*H. Instead, we see him decide to send a latrine to the North Koreans. As a reflection of Hawkeye’s mental state, the episode feels fractured, with no real plot. We see Hawkeye in surgery, Hawkeye refusing to go to sleep, Hawkeye spying on the camp, Hawkeye sending a telegram, Hawkeye talking to O’Brien the chopper pilot, Hawkeye talking to Henry after surgery, Hawkeye attending Frank’s lecture, and Hawkeye taking a picture of a latrine. It’s only near the end that the episode picks up and things start to happen. 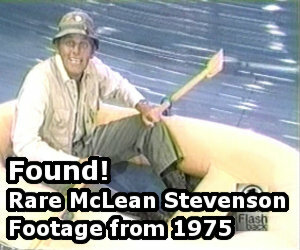 Trapper decides Hawkeye needs to be sedated. Him accidentally sticking Frank with the needle intended for Hawkeye isn’t very believable. I’d like to think Trapper would know his way around a needle and pay closer attention to avoid jabbing the wrong posterior. Oddly, after the first attempt to sedate Hawkeye fails, Trapper then goes to Henry and asks permission to sedate Hawkeye. The second attempt seems to fail as well but we learn in the tag scene that Hawkeye collapsed after 500 yards. Presumably, the ambulance came to a safe stop and neither the latrine nor General Clayton were harmed. We’re never told exactly how long Hawkeye has gone without sleep. Frank complains that he’s been asleep three times while Hawkeye operates. Later, Henry confirms that Hawkeye was on 24-hour call three nights in one week. Does that mean he wasn’t sleeping at all or not getting enough sleep between three lengthy stints in surgery? Despite his sleep deprivation, Hawkeye is aware enough at all times to keep track of the people who suggest he go to bed: Radar, Henry, and Margaret. Hawkeye sings a touching song from World War II. This was the second of 18 episodes written or co-written by Alan Alda. The title of this episode is a play on The Strange Case of Dr. Jekyll and Mr. Hyde by Robert Louis Stevenson. The basic concept, that an overworked doctor goes slightly out of his mind, was revisited in “Dr. Winchester and Mr. Hyde” during Season 6. In that episode, however, it wasn’t just exhaustion that pushed Charles overboard: he was using pep pills. Is the scene in which Hawkeye snoops around the 4077th in a camouflage poncho and a notebook usually cut in syndication? An orderly or corpsman slips and falls in the mud while rushing to meet the incoming wounded (right around 03:07 on the DVD). Was this scripted or did an extra actually fall down? I’m betting it wasn’t intentional. Why is Radar the one making the PA announcement at the start of the episode? The extras appearing as Hawkeye’s “herd” of nurse are: an unidentified redhead, Gwen Farrell, Sheila Lauritsen, and Marcia Gelman. Can anyone identify the comic book Radar is reading? It looks like the cover is missing. 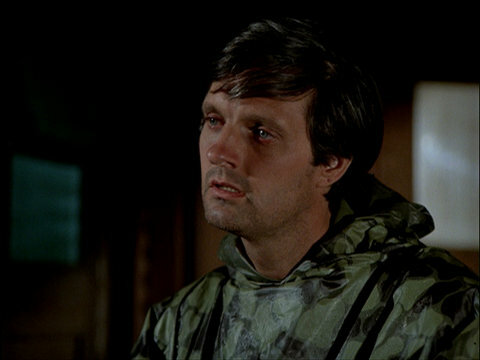 No, Hawkeye prowling around camp in his camo poncho and notebook isn’t cut from syndication, but what is is the tag scene where Hawkeye is finally asleep, whilst Trapper and Henry discuss his sleep-deprived behavior. A number of Season 1-5 episodes lost their tags in syndication. I’ll agree, this was really only a meh episode. What’s interesting, though, is that this episode is similar to “Tuttle,” in that a character is often refered to, but never seen, makes his only on-screen appearance; whereas that distinction went to Sparky in “Tuttle,” in this episode, it’s O’Brien the chopper pilot. Radar frequently refers to “Sparky”, which in the context of this show is redundant. “Sparky” is a generic term for a radio operator (more common in the navy than the army), but since Radar serves as the radio operator in MASH, he is either calling himself or calling the headquarters radio room (only necessary for relaying calls outside his range or contacting another branch of service). This is another case where the TV show simplifies real world procedure. A MASH would have 2-3 dedicated radiomen, trained in basic electronics, radio protocol, Morse code, and repair and maintenance of the equipment. Since the unit receives its orders via radio, it is essentially its only link to the world, the radio must be monitored twenty four hours a day. The radio would not be in the duty hut but in its own building – the “radio shack” – for privacy and safety; there would be an intercom style link to the duty hut and CO’s office, where they would have normal desk phones (not the canvas bag housed field phone often seen on the show, these were battery powered mobile radiotelephone units which would not have been used in camp). I actually quite enjoy this episode and only wish that Alda would have continued to write comedy such as this instead of the preachy dramas of later seasons. As for the comic book that Radar is reading — I think the title is “The Last Man” which can seen briefly while being held by both Radar and Hawkeye in the telegram scene. I can’t find any reference to a comic titled “The Last Man” so perhaps it was just the single issue title of Captain America or some other World War 2 era comic? Yes. I like the Henry/Frank joke as well. It makes my sides hurt for the rest of the week after watching it! I do like this episode. It has some excellent moments in it, and the jokes are side splittingly funny. My theory behind why radar is the PA announcer is that the usual announcer was absent for some reason or other, thus the next logical person/character would be Radar. I don’t know about that but the part where Hawk wakes up Trapper with news that they are in the middle of a war was new to me on MeTV’s broadcast tonight.